I woke up this morning feeling as if I would like to stay in bed. It was cold, dark and raining with the wind whistling around the back of my house. It was a real effort to get up and face the world. There are some days when you wish you could stay in bed under the warm covers. Anyway, I managed to surface from my pit and cope with what was thrown at me today. When I got home from work at about 5pm I had to get on with tea straightaway as my hubby had to go 0ut. I decided to make a Chicken and Apricot Tagine with couscous for our dinner but felt my usual urge to bake. As soon as I cream sugar and butter together and start cracking the eggs all the cares in the world just waft away. It’s like being creative and giving me therapy at the same time. I didn’t want to bake anything too fiddly or taxing tonight but something that looked fab yet tasted yummy and didn’t take forever to make. What could I go for? Pistachio Loaf cake as baked from the second Hummingbird Bakery recipe book. 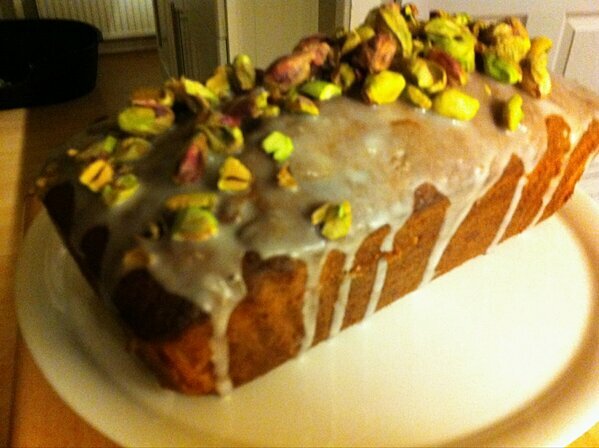 In the second of the Hummingbird Bakery recipe books “Cake Days” I remembered a pretty looking pistachio loaf cake. The cake contained chopped pistachios as well as some extra sprinkled on the top of icing drizzled all over the top. The colours of the pistachio nuts always appeal to me and they look gorgeous. I had some pistachio nuts in my cupboard left over and they needed using up so this recipe seemed perfect to try out. Out came the ingredients: butter, caster sugar, free range eggs, plain flour, baking powder, vanilla extract as well as the pistachio nuts. These had already had the shells removed and I roughly chopped them in preparation for putting in the cake. I also needed sour cream to put in the cake but I did not have any so hoped that I could substitute some natural Greek yoghurt in it’s place. I prayed this would work as I did not want to have to go out to buy a pot of sour cream just for a couple of tablespoons. I found a loaf tin liner and my trusty loaf tin, preheated my oven and began to bake. First the butter and caster sugar were mixed together with the creaming method and closely followed by the eggs. I then folded in the flour and baking powder carefully, followed by the yoghurt and the vanilla extract. Finally about two thirds of the pistachio nuts were added to the mixture. I hoped they wouldn’t sink to the bottom of the cake as often happens when I make cherry cakes. Into the oven went the loaf cake and before long a delicious smell began to waft through the kitchen. It was in the oven for about 50 minutes to an hour but I did keep checking. As the cake was cooling on the side I served up the dinner and left the cake to ice and decorate later. I was so hungry I could have happily cut into it straightaway but resisted the urge. We sat down to our dinner which was rather rushed as I had to go back out to the supermarket and my hubby went off to his meeting. Off to the supermarket I went somewhat reluctantly but was back to ice the loaf cake within an hour. The icing was simply icing sugar mixed with a little water to make glace icing. I still managed to make it go far too runny though but I must admit I wasn’t disappointed as I love the drizzly, runny look. On went the icing but silly me I forgot to put some baking parchment underneath to catch the drips. So, more cleaning for me then! After the icing went on the remainder of the pistachios were sprinkled on. Some wanted to fall off down the sides of the cake, the others stayed intact. Note to self- make sure the cake is COMPLETELY cool before decorating and attempting to cut it. I tried to cut a slice of cake only to find it was very springy, I should have waited for an hour or so before trying to cut the cake up. Pistachio Loaf cake- delicious and very quick and simple to make for any occasion. I’m looking forward to trying a small piece tomorrow afternoon when I get in from work. Let’s hope it tastes nice.